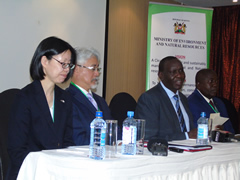 The Ministerial Forum hosted by the Ministry of Environment and Natural Resources (MENR) Kenya with support of Japanese　International Cooperation Agency (JICA) for the Horn of Africa was held in Nairobi, Kenya on 29th June 2017. 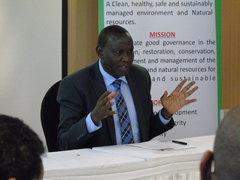 The forum was attended by the Secretary of Administration, Mr. William K. Kiprono, on behalf of Prof. Judi W. Wakhungu,　EBS, Cabinet Secretary for the Ministry of Environment and Natural Resources of Kenya, H.E. 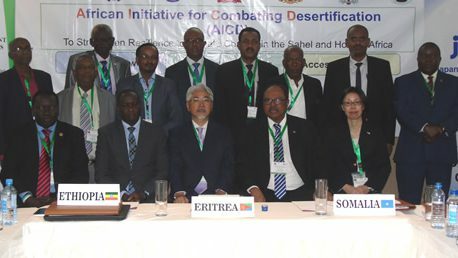 Hassan Abdel Gadr Hilal, Minister of Environment, Forests and Physical Development of the Republic of Sudan, H. E. Mr. Toshitsugu Uesawa, Ambassador, Embassy of Japan in Kenya and other high-level representatives from 5 countries. The progress and achievements of the initiative so far were shared, and a political commitment by the Horn of African countries to continuously fight against desertification as the top priority development agenda was confirmed.